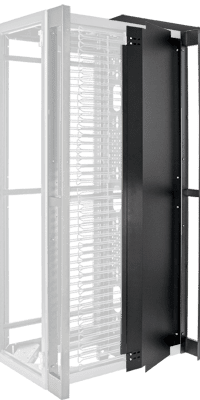 Titan DT racks provide the industry’s highest load ratings for your IT infrastructure by utilizing multi-formed channels, a fully welded frame and side uni-struts. 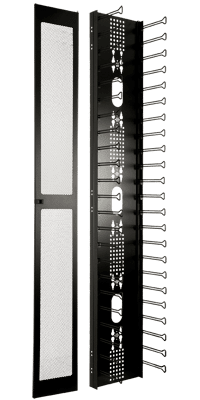 Millions of network cabinet and server rack configurations are available as standard, and custom modifications and designs are available upon request. All Titan DT racks have a 10-year warranty on materials and workmanship. Static: 5,400 lbs. Dynamic: 3,300 lbs. 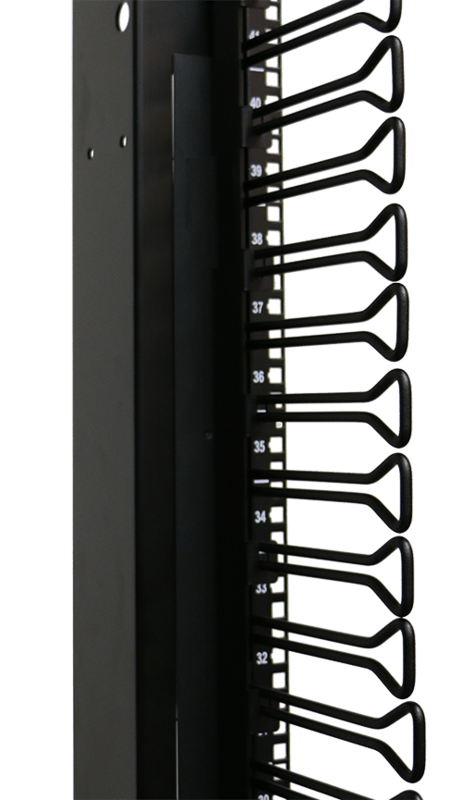 Design your rack on our Configurator for a quote, 3-D model, and technical specifications. 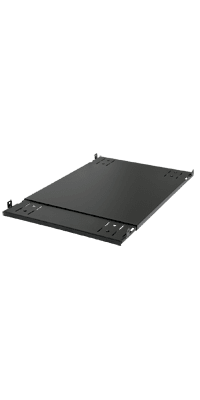 Mounting channels are capable of moving completely forward or backward within the rack to provide precise equipment adjustments. 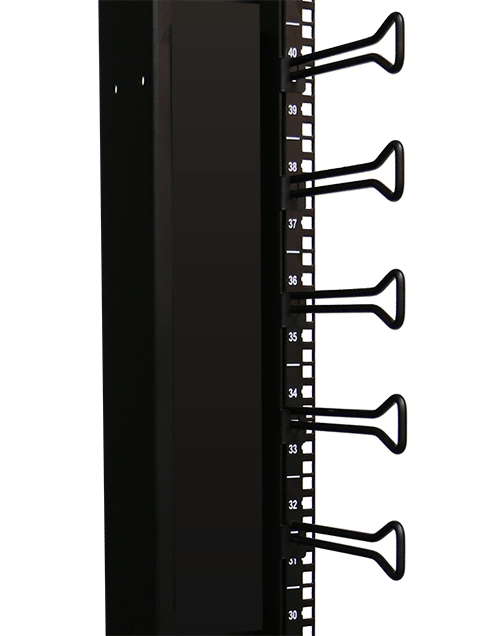 Mounting channels feature an M6 square-hole pattern and have individually numbered RUs for each rack unit, resulting in fast and easy equipment installation. 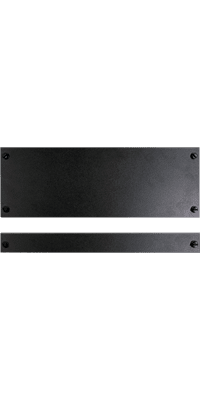 All Titan DT mounting channels have a durable black powder coat finish. 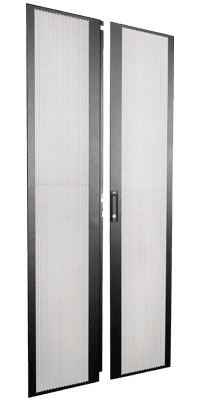 Side panels have been designed for use as baffle panels to contain thermal loads within a rack, or as side panels to close off an existing side of a rack. 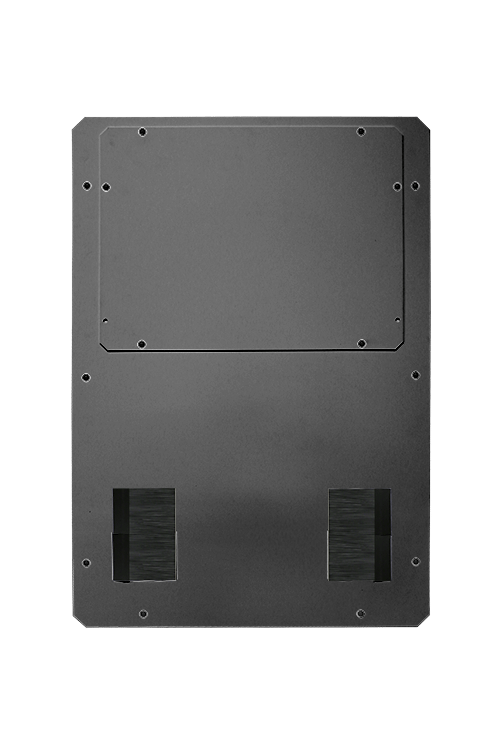 Side panels mount within the side perimeters of the rack for a flush design aesthetic. Face mount doors mount to the rack’s exterior surface. Titan DT Flush mount doors mount flush to the exterior of the frame. 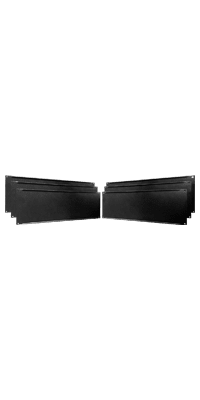 Solid inserts are available to close off vented areas when the Overhead Chimney Solution is used. 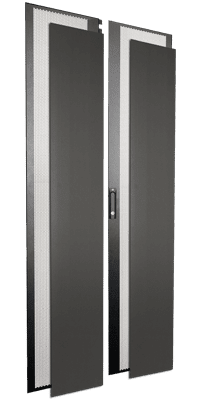 Titan DT French mount doors mount flush to the exterior of the frame. French doors are available to decrease swing radius versus full-width doors. This maximizes design efficiency within the data center. 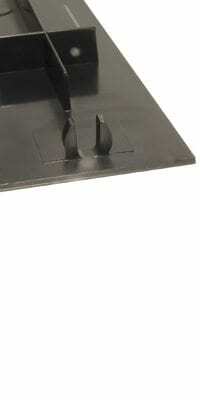 Solid inserts are available to close off vented areas when the Overhead Chimney Solution is used. 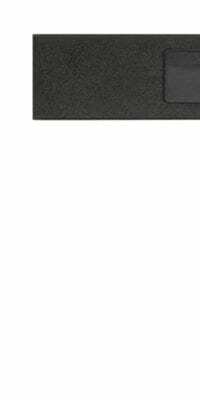 Heavy duty shelves are 1.75″H (1RU), fit 19″ width panel openings, and have depths of 17″ up to 40″. They are available in solid or vented models and are load-rated to support up to 250 lbs. 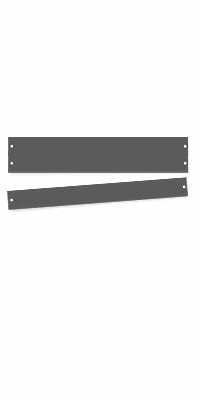 Shelves mount to the front and rear of the mounting channels. 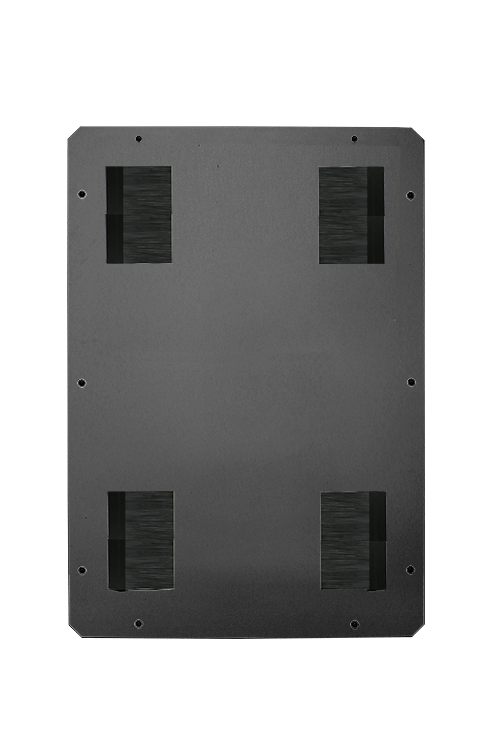 Available in four rack heights and two widths, power/cable panels mount in the rear of the rack and provide mounting support for PDUs and cable bundles. 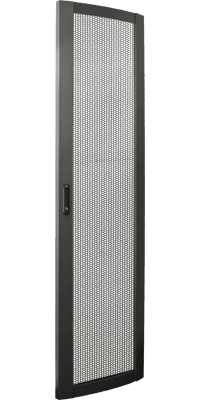 Power/cable panels have a combination of keyhole pattern slots, M6 square holes and cable egress ports. 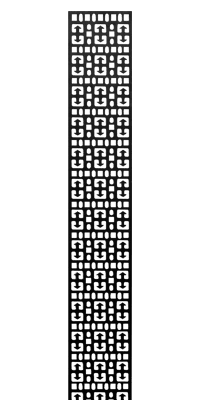 Cable lacing strips have a combination of M6 holes for cable ring mounting (HK-CR1) or equipment tie-down, while the slots can accept cable ties, fasteners, etc. 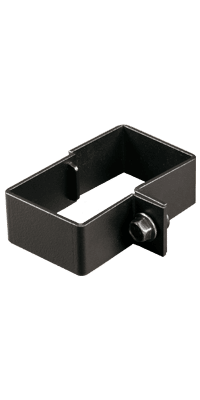 Cable rings easily mount to M6 holes in power/cable panels or cable lacing strips and provide an immediate tie-down point for cabling. Sold in packs of 10. 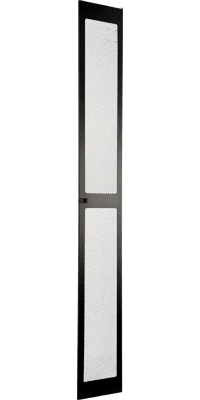 HCM Panels have a 2RU panel height (3.50”) and feature 10 ga. steel construction. Available in 4” and 7” depths. 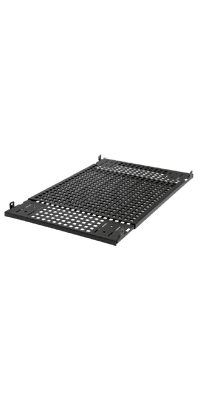 TitanDT offers cable raceways for large bundle drops of cabling or power strip mounting between racks. 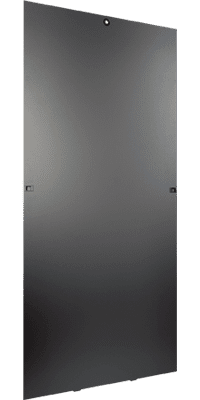 It takes 0RU, organizes cable and power requirements neatly and works against heat buildup that blocks exhausted air at the rear of the rack. Network switches typically have a large volume of cabling associated with them. The heat they generate must be redirected from side-to-side and front-to-rear. AMCO has created a passive solution for switch applications. 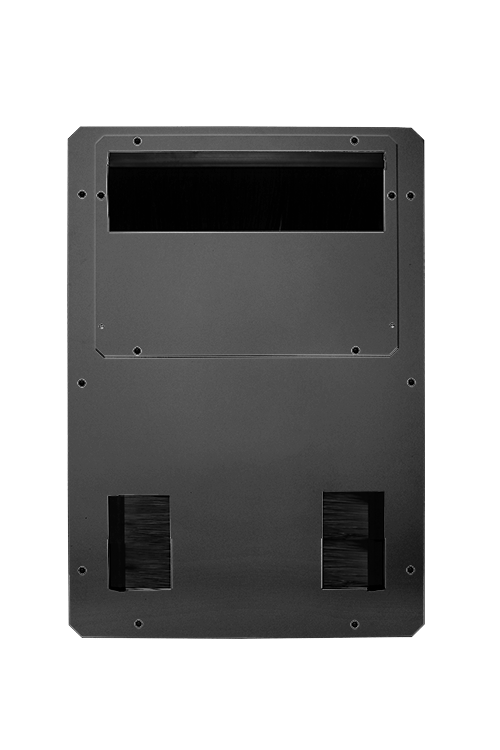 Note: Network Switch Cooling Solution includes top panel, baffle panel, and vented rear door. Note: Customer must select front raceway option of equal width to use with Network Switch Cooling Solution (ie. 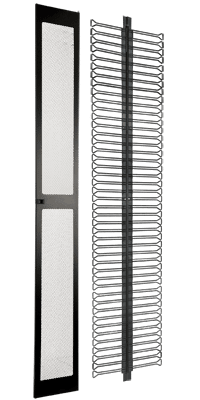 cable raceway door, cable raceway kit, etc.) Also must select a side panel and door. 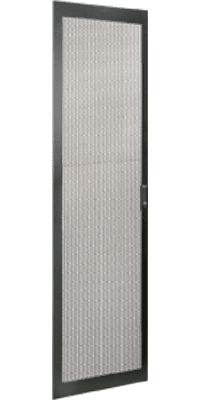 Isolating and containing the heat within the rack and directing it back into the overhead CRAC and CRAH systems is an effective passive cooling solution for high-density racks. 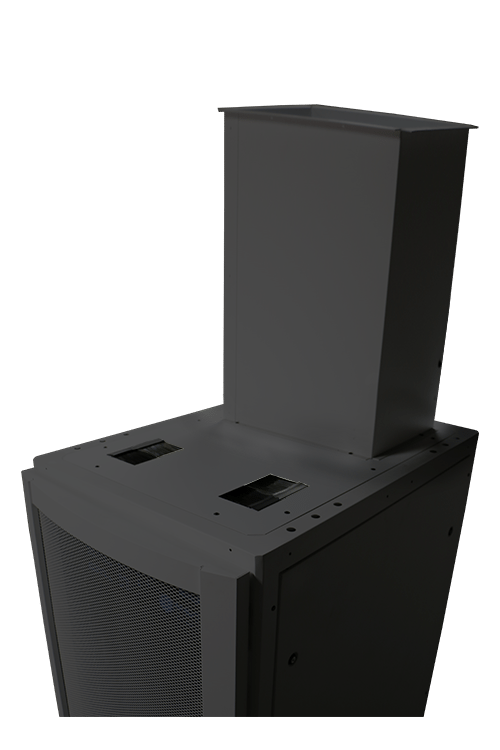 Chimney solutions prevent hot and cold air mixing in the cabinet, as well as hot air recirculation to the front of the rack. 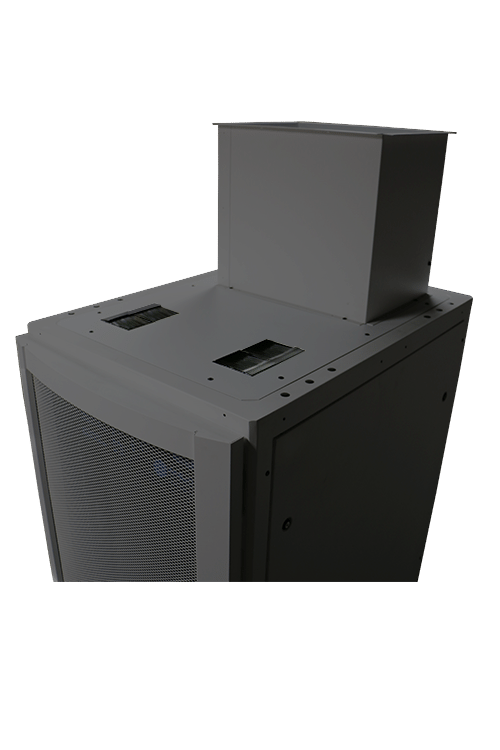 These systems are cost-effective and efficient, reducing the cost of over-cooling your data center. Kit includes top panel, air deflector, and top exhaust duct. 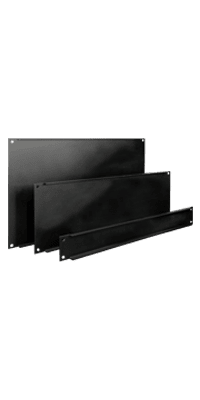 AMCO Enclosures understands the importance of power in today’s rack environment. 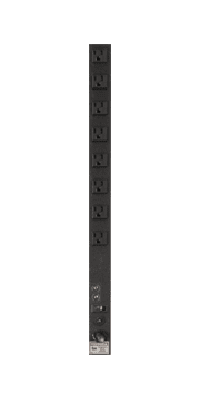 We offer a select grouping of standard vertical and horizontal 15A and 20A power strips for typical day to day designs. 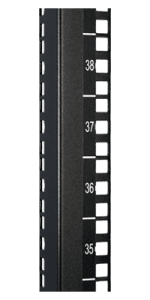 We can also provide metered, monitored, switched PDU’s and environmental units – in expanded 30A -120A models. A variety of cord lengths are available as well as other options. Lower your TCO and increase your racks energy efficiency. 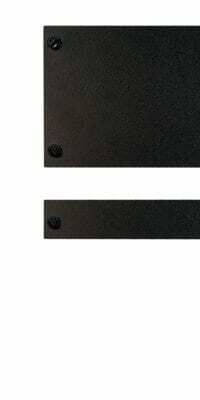 Blanking Panels help control airflow in your rack by blocking off open RU spaces. 6RU sheet can be snapped apart and used in 1RU thru 6RU sections. 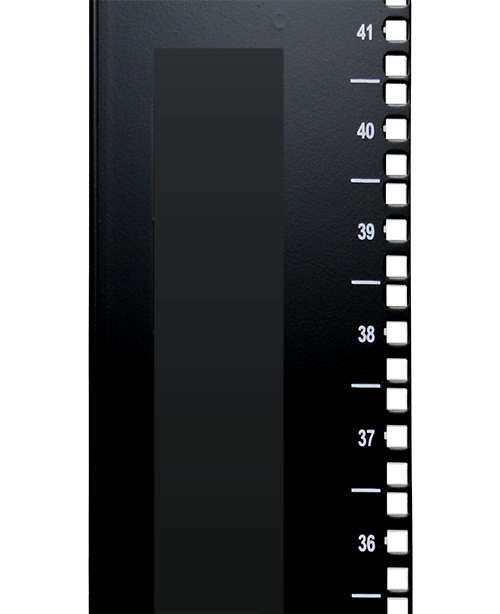 Lower your TCO while increasing your racks energy efficiency. Help control airflow in your rack by blocking off open RU spaces using blanking panels. 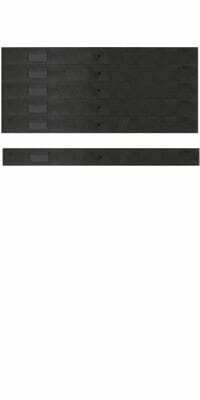 AMCO Tool-less steel blanking panels are available in 1, 2, 3, 4 and 8RU. 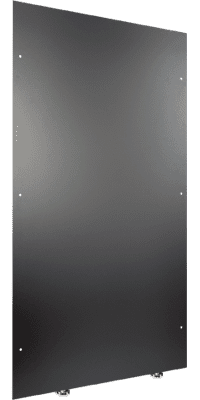 Formed blanking panels are aluminum and also available individually or in kits. *Not available in tool-less. 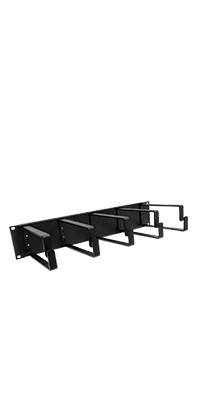 Chassis guides have a 2″ H x 2″ W profile and are fully adjustable front-to-rear, for rack depths 25″ through 36″. 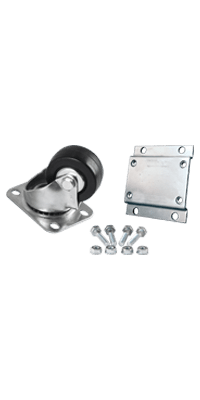 The flanges support component-mounted hardware in a minimal profile. Chassis guides support up to 125 lbs. 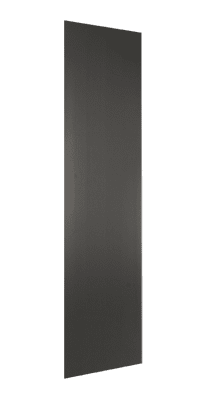 and feature a black, durable powder coat finish. 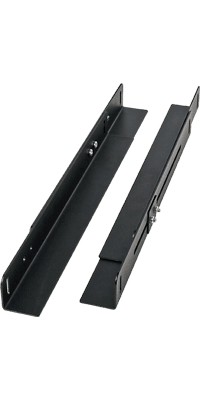 Chassis guides are for rack depths 25″ through 36″. 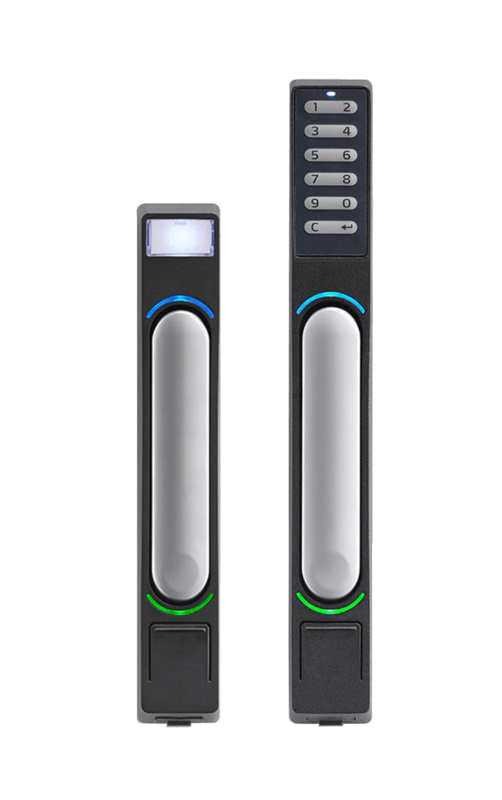 Data centers sometimes require casters for mobility. 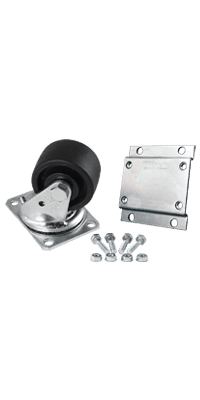 Light duty casters are used to roll in and place empty cabinets and heavy duty casters are used when moving populated cabinets. Each rack ships with 50 ea. 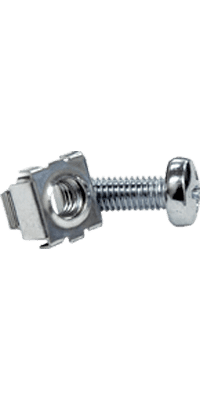 Dzus M6 inserts and screws to make mounting hardware/components easy to install. 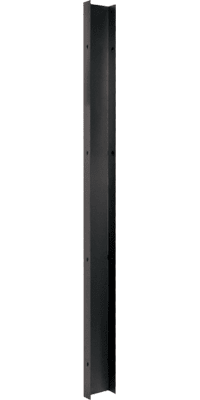 Additional mounting hardware is available for equipment mounting. 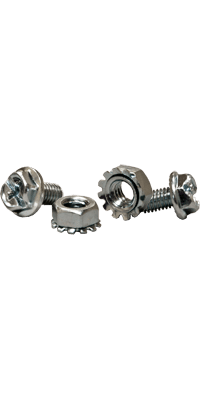 HKM6-25 or 50: M6 hardware includes 25 or 50 screws for equipment mounting. 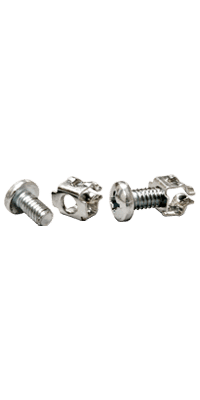 Dzus M6 Hardware HKDZ-25 or 50: M6 Metric Dzus includes 25 or 50 easy inserts and M6 clear chromate screws. FJB-TN: Frame joining bracket. 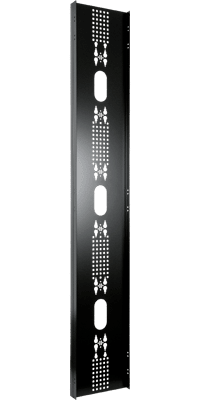 For joining frames that have equipment already installed. Sold separately. 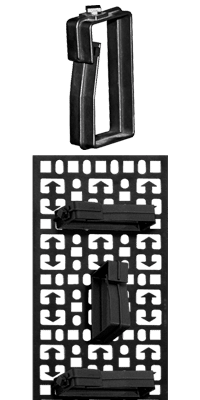 HK-R-TN: Frame joining kit (8 pieces) included with each cabinet.